Biting is an unwanted behavior that some rabbits display. 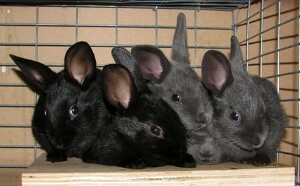 Because rabbits naturally live in social groups, they have a need to establish a social hierarchy. In the wild, rabbits use many methods, such as biting, lunging, and snorting, to develop a dominance order. Domestic rabbits still have the tendency to exhibit this dominance behavior, but when it leads to the injury of a human companion, there are steps that can be taken to modify the behavior. Although social behavior is a major reason for biting in rabbits, not all rabbits bite to display dominance. Rabbits are prey animals and may bite if they feel threatened. This defense mechanism can be seen in domestic rabbits. Rabbits bite for a variety of reasons. Juvenile and intact male rabbits have a tendency to bite due to raging hormones that alter their behavior. Stress can also cause a rabbit to bite. When a rabbit is stressed, it may bite or lunge to avoid an uncomfortable situation. Owners should interact with rabbits in a calm and soothing manner to help avoid this behavior. Generally, rabbits bite because they have a need to assert dominance, defend their food, or protect themselves from a predator. A dominant rabbit may bite an owner for no apparent reason. Indoor rabbits may suddenly nip at their owner’s hands and/or feet when they move too close to the rabbit’s territory. Dominant rabbits may also bite in this manner to tell the human to move away from an area. •	Making a sound when the rabbit bites you. •	Placing your hand on top of the rabbit's head and very gently pushing it to the floor for a few seconds. This exercise will help your rabbit understand that you are the dominant one in the relationship. •	Placing your rabbit in its cage for a short time-out. This step is best used if the first two steps do not work. Your rabbit should associate good behavior with freedom from its cage. •	Spaying or neutering your rabbit. Altering removes the hormones responsible for reproductive behaviors. These hormones can increase the chance of a rabbit developing a biting habit. Wild rabbits constantly compete with each other for food. When food is scarce, rabbits will fight with each other to defend what food they are able to find. This behavior is evident in domestic rabbits and can become a problem if rabbits bite their owners during normal feeding times. Although you are providing your rabbit with a plentiful amount of food, you are still seen as a threat. In a rabbit’s mind, the food must be defended no matter how much or how often it is offered. In addition, the action of placing food in the cage and then removing your hand correlates with the way rabbits investigate food in the wild. Wild rabbits will move in to closely examine a food source, but then they will move away quickly. •	Move your rabbit’s food bowl to a different area of the cage every day. Moving a food bowl helps prevent rabbits from recognizing the bowl as their territory. Rabbits will then be less likely to defend the bowl when it is moved and when they are being fed. •	Help your rabbit understand that your hand means “giving of food.” When rabbits begin to associate your hand with something good, they should refrain from aggressive behavior. To practice this technique, feed your rabbit outside of its cage by holding onto a long treat such as a carrot stick or piece of hay while your rabbit eats it. This will help your rabbit understand that the hand is providing food, not taking it away. •	Disperse food throughout the cage. Feel free to place food in your rabbit’s cage in places other than the food bowl. This helps prevent the rabbit from getting too attached to the food bowl itself. While rabbits are more prone to running away from danger, they may react by biting, lunging, and snorting if they are unable to make an escape, such as while caged. They may exhibit this behavior when they are being approached/picked up by a human being. Rabbits that display this behavior are usually just acting out of fear. •	Approach your rabbit from above its eye level. This will allow your rabbit to constantly see your movement. Rabbits have a blind spot below their chin and can be easily frightened when approached at eye level. •	If possible, reach through a top door in the cage to pick up your rabbit. Approaching a rabbit from above is far less intimidating than 10 fingers approaching at eye level. •	Understand that expectant and mother rabbits are only trying to defend their nests. These female rabbits are acting strictly out of instinct. If your rabbit is under the effects of motherly hormones, try to limit physical interaction. “Protection of young” is an extremely common response in female rabbits that are not fixed. Patience is the best method to solving biting in rabbits. Use positive reinforcement when the rabbit displays appropriate behaviors. In addition, handle the rabbit regularly in a calm and reassuring manner so it finds human handling to be a normal occurrence. By handling a rabbit in this manner, you will help your rabbit be calm and relaxed when interacting with you and others in your household.